Hold on to your kimonos, as homify 360° jets off to Nagoya, Japan, for another sneak peek at a noteworthy piece of architecture. 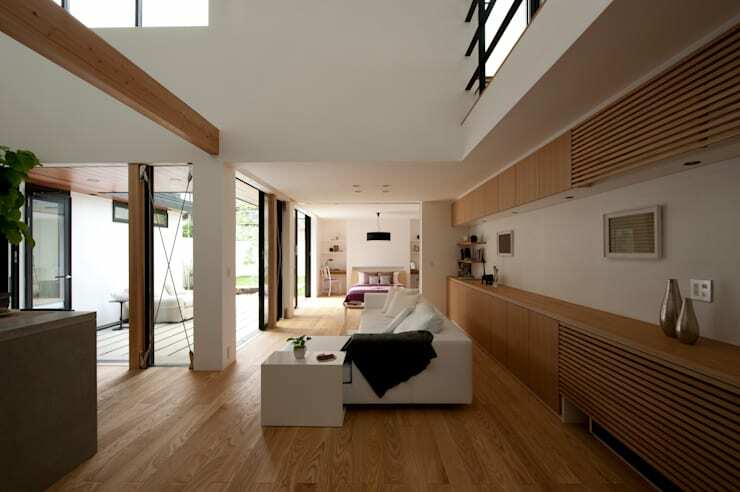 Here, it is said that the Asian Zen spirit is a vital factor in determining the quiet and peace levels of a home. 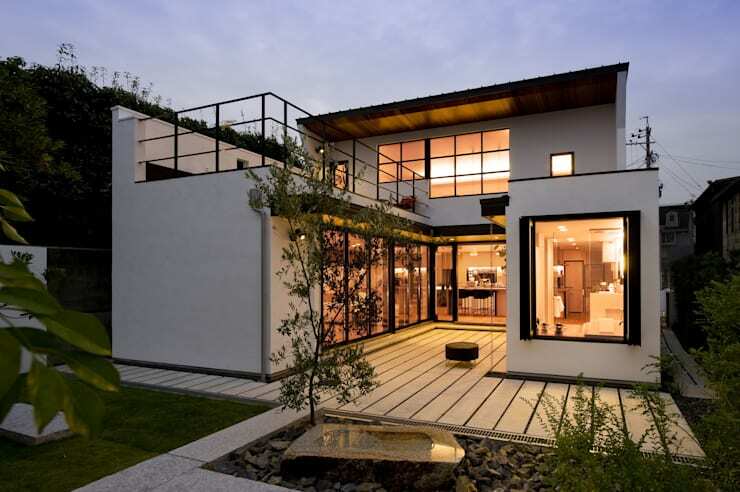 Although Zen Buddhism and its accompanying philosophy is an age-old belief, it is still with us today, and is a deciding factor for numerous homes and construction layouts worldwide. Incidentally, it also played a part in the design of today’s architectural piece – a family home in the suburbs. 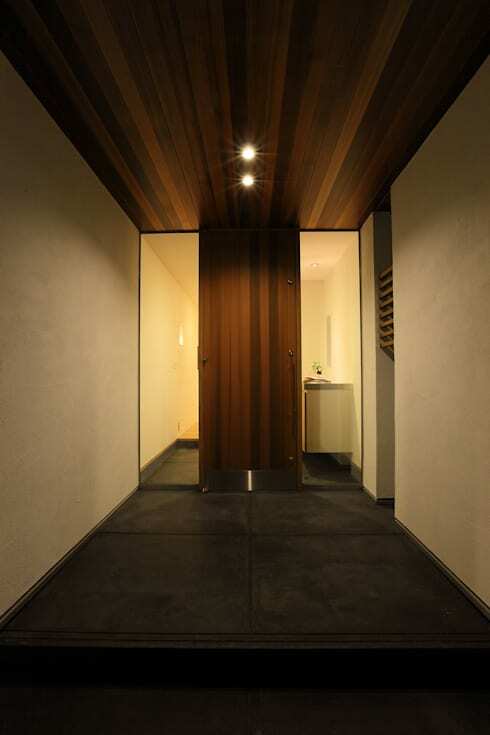 For Sakurayama-Architect-Design, the architects, simplicity played a big role in their design. In conjunction with nature, colour balance, light and accompanying elements, the house for today is more of a tranquil oasis than a suburban residence. Since nature played such a vital part in this house’s construction, we thought we’d kick off our tour with a look at the backyard – the lush, green, peaceful backyard. Fresh hues of green ensure a calming spot, made so welcoming by those sheltering trees and cool shades. The layout of the ground floor resembles a U-shape, forming a charming patio area that looks out onto the lawn and garden. A spacious balcony is located on the top floor, ensuring that everybody gets a fresh dose of the exterior view and air, regardless of what floor they’re on. While the interiors of the house are seemingly delightful (based on the slight glimpses we get by turning the interior lighting on), it is really that garden that caught our hearts. Beautifully designed and perfectly maintained, it is the epitome of modern design that boasts a strong Asian influence as well. 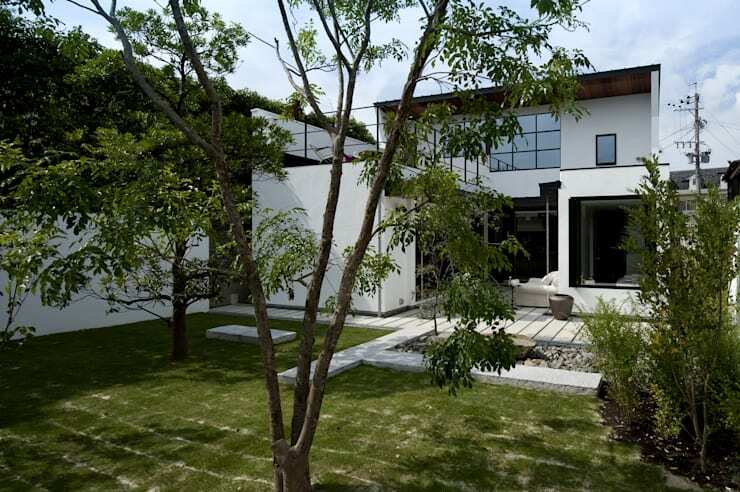 From this angle, we can see the usual Zen elements present in the garden: sand, stone, water, and trees/plants, all projecting a lifestyle of perfect harmony. Notice how faultless the calm white of the facade looks when combined with the natural greens of the garden, as well as the blue hues of the approaching dusk sky. On the side of the house, we find a narrow path that leads us directly into the garden. 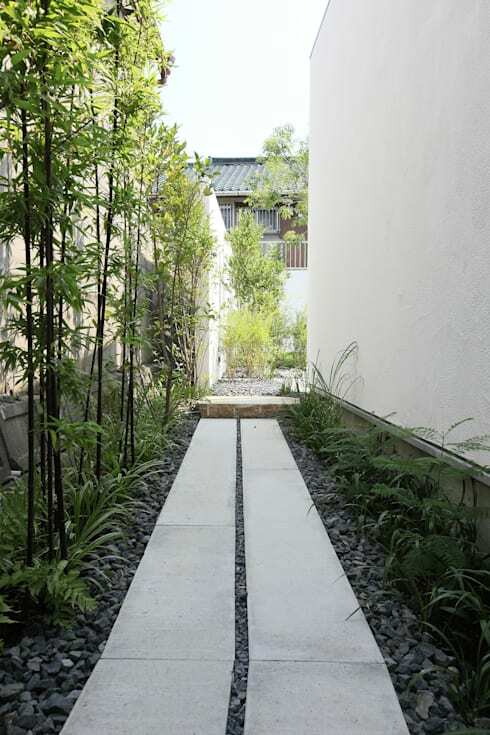 Even this small and slim element strongly projects a Zen influence: simple clean lines, subtle colour contrast and bold textural differences to create interest, and artful additions of stone that have a connection with nature. homify hint: Zen, which means “meditation”, teaches its students that enlightenment is achieved through the profound realization that one is already an enlightened being. The particular placement of access areas was designed in order to transmit calmness and serenity to the house and its inhabitants. The purpose of including oriental décor is to create an environment that improves the mood of all those who enter. 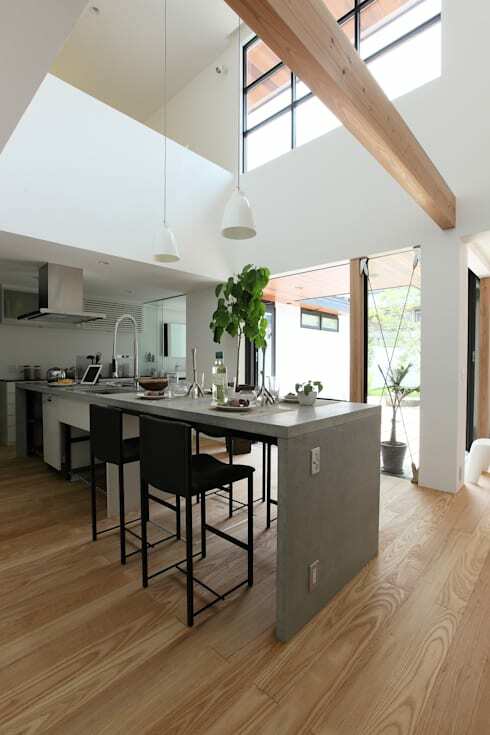 Having said that, it is our opinion that the combination of timber planks, concrete floor, and clear glass transmits a message of raw, neutral beauty, fitting in most superbly with this Asian-fused environment. Taking a look at the interiors, we can see that the furniture is made up of simple straight lines and light neutral colours, all intent on inviting in positive vibes. Thanks to the generous glass doors and windows, natural light flows freely inside, ensuring a bright connection with the outdoors. But Asian or not, including natural wood in interiors is always a winning idea, and it would seem that our architects agree: wood has been included seemingly everywhere. According to Zen tradition, time dedicated to cooking and cleaning needs to be achieved with utter devotion and meditation. No doubt this advice was taken into consideration when the kitchen was designed: this culinary space exudes a strong vibe of coolness and tranquillity, which will no doubt calm anybody who enters here, from five-star cook to culinary novice. Sufficient space has been ensured in this kitchen; the cook will have no trouble finding enough surfaces for chopping and slicing, while the guests can enjoy comfortable seating at the elongated counter. Seeing as that garden outside holds such an abundance of peace and beauty, it should come as no surprise that the bathroom (very much resembling a spa) looks out onto it. In fact, a generous-sized window opens up completely, allowing the bather a full-blown view of Mother Nature at work. Sky, stones, water, and grass are all present while we’re soaking up those soothing bubbles, doing a perfect job of complementing the crisp white hues of the bathroom interior. 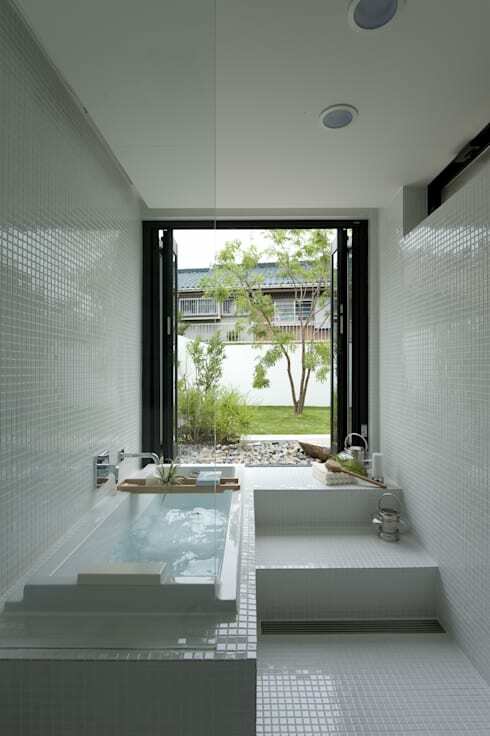 Enjoy looking at our: Brilliant, beautiful bathroom trends. Is it working? Has your stress levels descended just by looking at that spa-like house? Tell us what you think of it.